Mucopolysaccharidoses (MPS) are a subgroup of 11 monogenic lysosomal storage disorders due to the deficit of activity of the lysosomal hydrolases deputed to the degradation of mucopolysaccharides. Although individually rare, all together they account for at least 1:25,000 live births. In this study, we present the genetic analysis of a population of 71 MPS patients enrolled in a multicenter Italian study. We re-annotated all variants, according to the latest recommendations, and re-classified them as suggested by the American College of Medical Genetics and Genomics. Variant distribution per type was mainly represented by missense mutations. Overall, 10 patients had received no molecular diagnosis, although 6 of them had undergone either HSCT or ERT, based on clinical and enzymatic evaluations. Moreover, nine novel variants are reported. Conclusions: Our analysis underlines the need to complete the molecular diagnosis in patients previously diagnosed only on a biochemical basis, suggests a periodical re-annotation of the variants and solicits their deposition in public databases freely available to clinicians and researchers. We strongly recommend a molecular diagnosis based on the analysis of the “trio” instead of the sole proband. These recommendations will help to obtain a complete and correct diagnosis of mucopolysaccharidosis, rendering also possible genetic counseling. • MPS are a group of 11 metabolic genetic disorders due to deficits of enzymes involved in the mucopolysaccharides degradation. • Molecular analysis is commonly performed to confirm enzymatic assays. • Eighty-six percent of the 71 patients we collected received a molecular diagnosis; among them, 9 novel variants were reported. • We stress the importance of molecular diagnosis in biochemically diagnosed patients, encourage a periodical re-annotation of variants according to the recent nomenclature and their publication in open databases. The online version of this article ( https://doi.org/10.1007/s00431-019-03341-8) contains supplementary material, which is available to authorized users. Mucopolysaccharidoses (MPS) are very rare, monogenic, metabolic disorders due to the deficit of the lysosomal enzymes normally degrading mucopolysaccharides or glycosaminoglycans (GAG), this causing their pathological accumulation in most tissues and organs. GAG accumulation progressively leads to cell dysfunction and death causing impairment of most organ/systems, including the brain in about two-thirds of the cases. Incidence of MPS varies for each disorder and in different populations and ethnic groups, with overall prevalence going from 1.2 up to 16.9 over 100,000 live births recorded in the USA and Saudi Arabia, respectively . MPS diagnosis normally proceeds from clinical suspicion, going through biochemical analysis, including urinary GAG and enzymatic assays, and is confirmed by molecular diagnosis . 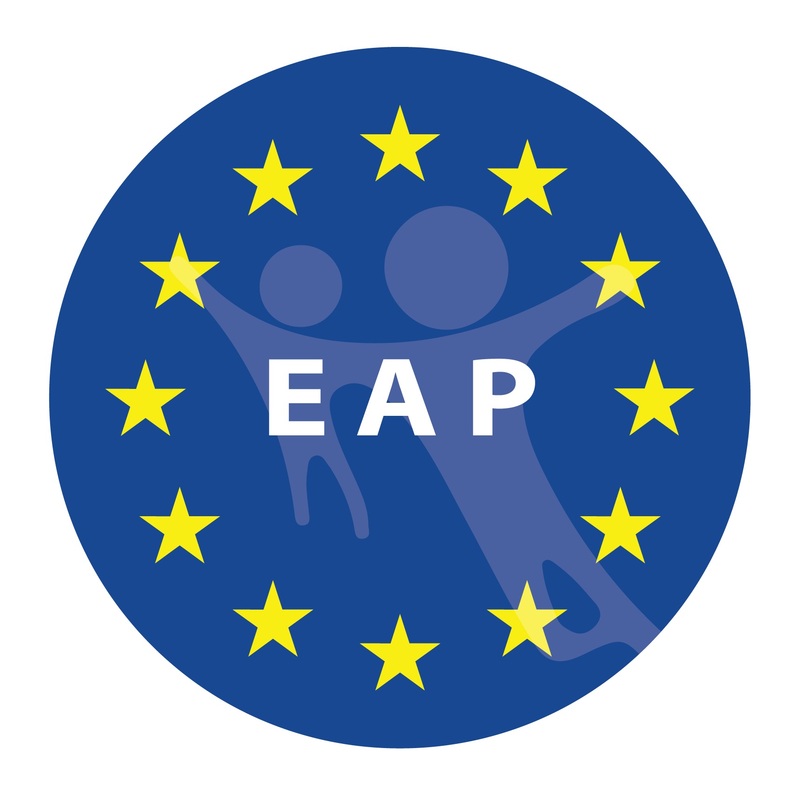 Beyond symptomatic therapies, in the last 10–15 years treatment of these disorders has been mainly accomplished by enzyme supplementation, the so-called enzyme replacement therapy (ERT), available for MPS I, MPS II, MPS IVA, and MPS VI. Also, hematopoietic stem cell transplantation (HSCT) has been successfully applied almost exclusively to MPS I, while still debated for other MPS . In addition to commonly requiring weekly hospitalization, ERT is an expensive procedure implicating important investments from the National Health Care Systems. Therefore, ethical and economic reasons impose its application to patients with a definite diagnosis. In this study, we collected and evaluated the molecular diagnosis of a group of MPS patients enrolled in a multicenter Italian study, underlining its importance, together with enzymatic assays, to confirm the MPS clinical suspect and to reach a correct diagnosis. Importantly, a definite molecular diagnosis represents an essential tool for effective genetic counseling. Seventy-one subjects affected by MPS were enrolled in a multicenter Italian study, financed by the Italian Ministry of Education, University and Research (MIUR), planning, among others, the collection of clinical, biochemical, and molecular data during a follow-up evaluation. All procedures performed were in accordance with the ethical standards of the institutional research committee and with the 1964 Helsinki declaration and its later amendments. Informed consent was obtained from all individual participants included in the study. Here, we report data related to genetic diagnoses, which were performed in different laboratories applying, in most cases, standard molecular methods (PCR amplification and Sanger sequencing); in few specific cases, second- or third-level analyses were conducted aiming to detect gross deletions, rearrangements, CNVs, or deep intronic variants. Genetic data was extrapolated from a web-based platform shared among the different units. For the patients with no molecular diagnosis available, molecular genetic analysis was not feasible at the time of enrollment in the present study, as patients’ DNA samples were not available. Variants reported in the original diagnostic reports were checked using Name Checker (https://www.mutalyzer.nl/name-checker) and, when necessary, were re-annotated on the basis of the most recent HGVS nomenclature (version 15.11; http://www.hgvs.org/nutnomen/). In addition, the novel missense variants were in silico tested for pathogenicity with four different prediction tools: DANN , MutationTaster , GERP , SIFT ; moreover, a structural evaluation of the impact of the amino acid substitution on the enzyme structure was performed through the tool HOPE . Finally, all variants were further analyzed, (re-)classified according to the criteria suggested by the American College of Medical Genetics and Genomics (ACMG)  and submitted to ClinVar database (https://www.ncbi.nlm.nih.gov/clinvar/) where they will be publicly available. In the population examined, 16 patients were affected by MPS II (22.5%), 13 by MPS IIIA (18.3%), 12 by MPS IVA (16.9%), 9 by MPS I (12.7%), 9 by MPS IIIB (12.7%), 7 by MPS VI (9.9%), 2 by MPS IIIC, 2 by MPS IVB, and 1 patient was affected by MPS IIID (Table 1). Molecular diagnosis had been performed for 61 subjects out of 71 enrolled in the study (85.9%). Age at diagnosis varied for the different disorders and severity. Generally, severe forms were diagnosed earlier, likely due to the early appearance of first clinical signs and symptoms. This is evident when different forms are described within the same disease, as in MPS I and MPS II. A significant difference between severe and attenuated forms was registered in our population for MPS I, with an average of 1.1 and 6.3 years at diagnosis respectively. This was also registered for MPS II, with an average of 2.9 and 6.6 years at diagnosis respectively (this last value was calculated excluding patient P14, a subject presenting a mild phenotype, who was diagnosed at 44.3 years of age). As for MPS IIIA and MPS IIIB, in our population diagnosis was reached on average around 5 years of age, except in one case of MPS IIIB, reported with an attenuated phenotype, and diagnosed at 18 years of age . Most, if not all, MPS IVA cases were reported as severe and diagnosis was achieved on average at 3.2 years of age. The only 2 cases registered for MPS IVB are both reported with a mild phenotype and were diagnosed around 10 years of age. MPS VI, although commonly not affecting neurological functions, usually presents a severe skeletal phenotype, thus early diagnosis can be obtained. In our population, mean age at diagnosis for MPS VI was 1.8 years. 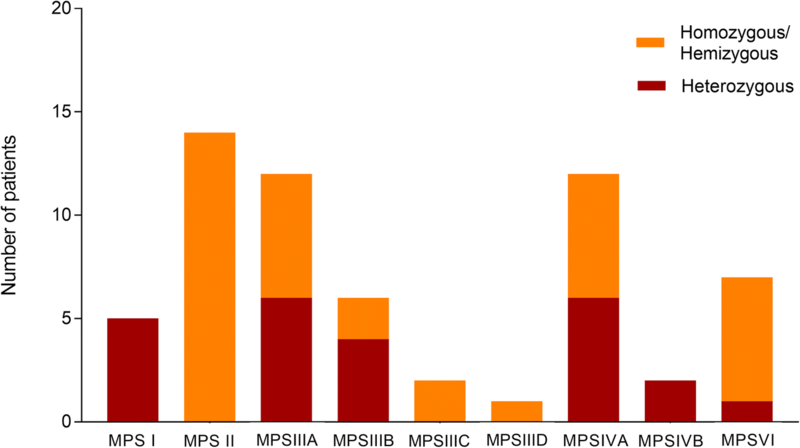 Distribution of diagnosed patients in the different MPS types is shown in Fig. 1. A missing molecular diagnosis was registered in 4/9 MPS I patients, 2/16 patients affected by MPS II, 1/13 MPS IIIA patients, and 3/9 MPS IIIB patients. Thus, for MPS I and MPS II patients, for whom either HSCT or ERT have been available for several years, a total of 6 out of 25 patients did not receive a molecular definition. Three of them underwent HSCT and 3 underwent ERT, based on clinical and biochemical evaluations. For 4 of them, molecular analysis of the genes was not feasible at the time of diagnosis. For all of them, it was never completed afterward. As for the MPS IIIA and B patients, 4 of which remained molecularly undiagnosed, we suggest this may be due to the delay with which MPS III patients are sometimes clinically recognized and also to the lack of treatments for all MPSIII, which may cause a limited clinical follow-up with time. Overall, of the 10 patients with no molecular diagnosis, 7 had been clinically diagnosed 20 or more years ago, while most of the patients (70%) with molecular diagnosis came to the clinical observation more recently in the last 15 years. Thus, we could argue that in the past, molecular diagnosis likely did not receive significant attention in the completion of the patient diagnosis, given also the fact that some MPS genes were identified in the early 2000s. Moreover, an evaluation of the timing elapsed between clinical/enzymatic diagnosis and molecular diagnosis showed in general, for all MPS taken together, a delay of about 4.6 years of the molecular diagnosis with respect to the clinical/enzymatic diagnosis, with a range from 0 up to 22 years. A summary of all identified genotypes is reported in Table 1. Since for some patients, variants had been identified several years ago, we checked all of them and when necessary we re-annotated them according to the most recent HGVS nomenclature. On the whole, we report 87 variants, of which 67 are unique. Nine of the reported variants had never been described in the literature before. Analysis of the genetic alterations identified in the examined population showed that, as expected, most of the variants were missense (about 70%), followed by small deletions (9%), large deletions/rearrangements (7.5%), splicing (7.5%), nonsense (4.5%) and sense variants (1.5%) (Table 2). In the context of MPS, we need to consider that while small variants may be identified in all disorders, other variants, as complex rearrangements, may be more easily encountered in subjects affected by MPS II due to homologous recombinational events between the iduronate 2-sulfatase gene (IDS) and its pseudogene (IDS2) . Homozygous patients provide a valuable tool to evaluate the in vivo effect of each specific variant, helping to possibly define genotype/phenotype correlations. In this respect, we underline as such evaluations may only be possible based on a strict collaboration between clinics, defining the patient phenotype based on shared severity criteria, and laboratory, carrying out the molecular analysis. In addition, information on parents’ ethnicity and consanguinity provided to the laboratory would be very important for the interpretation of the obtained molecular results and for genetic counseling. Apart from MPS II which, being an X-linked disorder, is always caused by a single pathogenic variant (hemizygous condition), 6/12 of the MPS IIIA as well as 6/12 of the MPS IVA patients presented a condition of homozygosis. Also, 2 MPS IIIB, 2 MPS IIIC, and 1 MPS IIID patients showed a condition of homozygosis. Interestingly, 6 out of the 7 MPS VI patients presented a condition of homozygosity for different pathogenic variants; this reflects a general condition for this disorder in which a wide analysis of the literature has shown that more than 55% of the patients present genomic homozygosity for different pathogenic variants of the ARSB gene . Eleven of the 23 homozygous patients had consanguineous parents, this explaining homozygosity, in these cases likely independent from the geographical distribution of the variants. It is known that gross deletions or gene rearrangements are commonly associated with severe clinical phenotypes. In our study, this was confirmed in 3 MPS II severe patients, whose causative mutations were represented by the deletion of several exons of the IDS gene (P19 in Table 1), deletion of the whole IDS gene (P25) and an event of homologous recombination between IDS gene and pseudogene (P23). This was also seen in MPS VI, where the deletion of exon 5 of the ARSB gene was associated with a severe phenotype (P69 and P70, Table 1). Table 3 summarizes the phenotypes found in this study in homozygous patients carrying point mutations and those described in the literature with the same variants. As for the other 11 IDS variants identified in this study, mainly represented by missense mutations or small deletions, most of which is previously described, they were in the literature variably associated with either severe or attenuated or mild phenotypes (Table 3). Five of them are reported as associated with the same phenotype reported previously in other patients: 2 of them confirming a mild phenotype (P12 and P21 in Table 3) and 3 of them confirming a severe phenotype (P13, P20, and P22 in Table 3). However, the small number of patients analyzed for each variant does not allow drawing conclusions on these genotype-phenotype correlations. With regards to homozygous patients identified in all MPS, but in MPS I and MPS IVB, a genotype-phenotype correlation analysis was conducted in 6 MPS IIIA patients, 3 of which confirming a previously described phenotype (P26, P34, and P35 in Table 3). For the other 3 homozygotes, no confirmation of previously described phenotypes was possible, thus not allowing to hypothesize any genotype-phenotype correlation. Concerning MPS IVA, 2 homozygous patients out of 6 confirmed previously described severe phenotypes (P56 and P60). 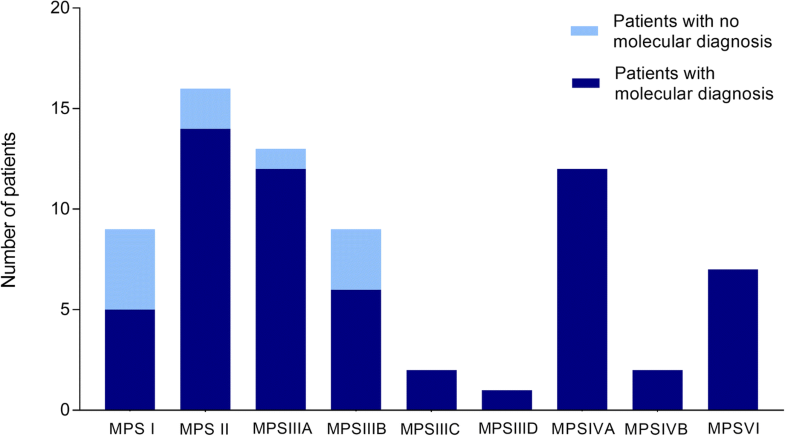 Finally, as for MPS VI, none of the homozygotes’ phenotypes unequivocally correlated with previously described patients (Table 3), therefore we could not confirm any genotype-phenotype correlations. Of the 2 patients showing a mild phenotype, one was carrying in homozygosis the variant c.245T>C (P71 in Table 1), previously undescribed. Other genotype-phenotype correlations for this gene could be inferred indirectly; as for the splicing variant c.1213+6T>C, this was identified in homozygosis in a severe patient and in heterozygosis in a mild patient, compound heterozygote for the variant c.725A>C. This last variant, still presenting “not enough evidence” of pathogenicity according to ACMG classification, could confer the mild phenotype. In addition, the novel missense variants [IDS: c.811A>T; IDS: c.1563A>T; IDS: c.542A>G, SGSH: c.542A>G, NAGLU: c.1144G>T, and ARSB: c.245T>C] were evaluated for pathogenicity with four different prediction tools (DANN, Mutation Taster, GERP and SIFT) which all confirmed the potential pathogenicity of the tested variants. This was also confirmed by the application of the tool HOPE that predicted potential remarkable structural changes in the enzyme structures which could affect the catalytic activity of the examined proteins. Results of the mentioned in silico evaluations are reported in the Online Resource. Finally, all variants were re-evaluated according to the recent classification of ACMG (Table 2). The results of this evaluation evidenced that more than half of the variants (almost 56%) fell into the “Likely pathogenic” class, 31% into the “Not enough evidence” class, and the remaining resulted “Pathogenic” (13%). The present study underlines the need to complete the diagnostic workup of MPS patients previously diagnosed on a biochemical basis, through the identification and, possibly, the validation of the related gene variants. Molecular diagnosis is essential to confirm an enzyme deficit and provides diagnostic certainty to disorders for which the application of available treatments requires hospitalization and is extremely expensive. Moreover, we strongly recommend a molecular diagnosis based on the analysis of the “trio” instead of the sole proband, thus allowing the correct definition of the family inheritance and the identification of the de novo variants, which require different counseling. Finally, we suggest a periodical re-annotation of the variants according to the most recent version of HGVS nomenclature and solicit laboratories to perform their deposition in public databases (as LOVD, ClinVar, etc. ), freely available to all clinicians and researchers. These recommendations will help obtain a complete and correct diagnosis of mucopolysaccharidosis, rendering also possible genetic counseling. In these last years, molecular diagnosis of MPS, and in general of monogenic-inherited disorders, has taken advantage of new analytical approaches which have widen the possibility of investigation and have shortened the timing of diagnosis. This includes next-generation sequencing, applied to targeted genes (panels) or, more widely, to exome (whole exome sequencing, WES) or genome analyses (whole genome sequencing, WGS). Moreover, validation of the new genomic variants can now partly take advantage of the availability of several public databases collecting exomic or genomic data from large scale sequencing projects (ExAC, gnomAD, etc.). These tools, used with the appropriate critical evaluation, may now allow more rapid and correct identification and validation of the genomic variants associated with a specific clinical phenotype. Authors are grateful to patients and their families who accepted to be enrolled in the multicenter study. 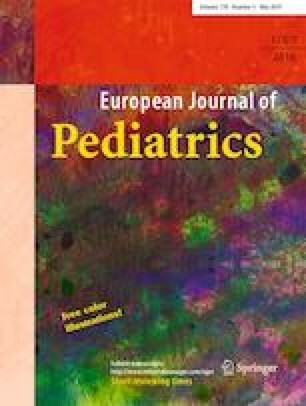 A special acknowledgement to Prof. Orazio Gabrielli, [Department of Clinical Sciences, Division of Pediatrics, Polytechnic University of Marche, Ospedali Riuniti, Presidio Salesi, Ancona (Italy)], who coordinated the Italian multicenter study. AZ collected and analyzed patients’ genetic data and wrote the manuscript; AR, DC, RB, and LS collected genetic data of their clinical centers and critically revised the manuscript; FD, LR, NV, SL, and FB performed some genetic analysis, gave support to genetic data analysis, and critically revised the manuscript; MS critically revised the manuscript; RT analyzed patients genetic data and wrote the manuscript. All authors read and approved the final version of the manuscript. This work was financed by the Italian Ministry of Education, University and Research (MIUR), PRIN 2012 Prot. 20122EK9SZ. MS received educational grants and travel grants from BioMarin, Chiesi, Genzyme, and Shire. DC received travel grants from BioMarin, Genzyme, and Shire. AZ, FD, LR, AR, RB, NV, LS, SL, FB, and RT declare no conflicts of interest. All procedures involving humans performed in the study were in accordance with the ethical standards of the institutional research committee and with the 1964 Helsinki declaration and its later amendments.